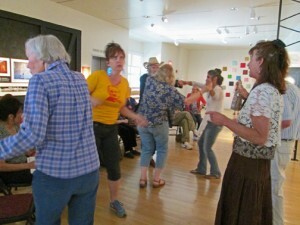 On Wednesday, June 25, the History Museum happily welcomed the Alzheimer’s Poetry Project and 29 participants for a 90-minute workshop that was, in a word, wonderful. Or perhaps it was frabjous, an appropriate word given the Lewis Carroll overtone the day took on. Gary Glazner (at left), a Brooklyn-based poet with strong New Mexico ranching roots, directs the project, which helps people with memory illnesses, their caregivers and family members find a moment of respite through the literary arts. He’s brought the project to the museum before, but this was the first time he had the psychedelic images and cameras of Poetics of Light: Pinhole Photography to work with. Joined by Palace Press Director Tom Leech, Glazner began in the museum’s main lobby, leading participants through a museum-ish poem, calling out a line then encouraging them to repeat it. Then repeating it again. Then adding a rhythm section. Then encouraging a hip bump. Then a dance move. And laughter all the way. Glazner asked folk what the painting looked like, felt like, smelled like, sounded like. A cacophany of answers followed. Honey. Oranges. Morning rain. Bzzzzz-bzzzzz-bzzzzz. One woman spied a rabbit and hopped up, scrambling around the group in imitation of a bunny. Another flapped her arms as elegantly as a ballet dancer. Alice in Wonderland came to one man’s mind. and a rabbit eating it, a rabbit running. 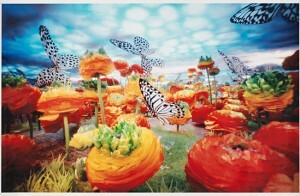 Where the flowers taste like cotton candy, oranges, and honey in a magical museum. and leaves wet as the rain clouds. Hear a slight rustle, laughter, busy like bees. Bzzzz. Bzzzz. Whoosh. Whoosh. Flap. Flap. Bzzzz. Whoosh. Flap. Flap. Feels warm, soft, and floaty. There’s no sense. There’s only nonsense. We could go forever and ever in them. Amen. Forever and ever. Forever. Halleluiah! 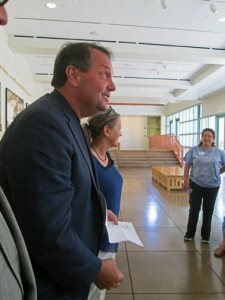 Later in the week, Glazner gathered with staffers and others involved in the arts as well as aging issues to plan a Dementia Arts Conference for Oct. 25 at the museum. (Stay tuned for frabjous details.) In the meantime, consider the woman who brought her father to the event and left beaming at the joy she had witnessed. “It was just wonderful,” she sighed, although, her father added, “It would help to have a fiddle.” To which we say: Callooh! Callay! The American Association for State and Local History will bestow an Award of Merit for Leadership in History on the New Mexico History Museum in honor of the excellence achieved by Cowboys Real and Imagined. The award recognizes the 2013-2014 exhibition, its public programs, and the publication of Jack Thorp’s Songs of the Cowboys by the Press at the Palace of the Governors. From April 14, 2013, through March 16 of this year, Cowboys Real and Imagined was a major exhibition that traced the cowboy’s roots in Spanish New Mexico and carried his (and her!) story through modern-day rodeos, movies, singers and ranch hands struggling through climate change. Programming was funded by the New Mexico Humanities Council, which shares in the AASLH award. Special programming events included classic cowboy movie nights; panel discussions and presentations that focused on gay cowboys, Hispanic cowboys, Jewish cowboys, and African American cowboys; musical performances; and a Wild West Weekend with re-enactors and demonstrators. Jack Thorp’s Songs of the Cowboys represents the first fine-press printing of the classic book, which was born in New Mexico and, in a way, gave birth to country-western music. Tom Leech, director of the Palace Press, and Arlyn Nathan, a book designer and typography instructor at the Santa Fe University of Art and Design, also won the esteemed Carl Hertzog Award from the University of Texas at El Paso for the caliber of the book’s production. Throughout its run, Cowboys Real and Imagined drew a steady stream of visitors and was so admired that portions of the exhibit live on. Cowboys: The Real Deal opens June 26 at the New Mexico Farm and Ranch Heritage Museum in Las Cruces. The exhibit helped the museum earn a 2013 “Cowboy Keepers Award” from the National Day of the Cowboy. The AASLH Leadership in History Awards, now in their 69th year, are the most prestigious recognition for achievement in the preservation and interpretation of state and local history. In a media release, AASLH said it is conferring 77 national awards honoring people, projects, exhibits, books and organizations. The winners represent the best in the field and provide leadership for the future of state and local history. The awards will be presented during the 2014 AASLH Annual Meeting in St. Paul, Minn., on Sept. 19. The AASLH awards program was initiated in 1945 to establish and encourage standards of excellence in the collection, preservation, and interpretation of state and local history throughout the United States. For more information about the awards, contact AASLH at 615-320-3203, or go to www.aaslh.org. The American Association for State and Local History is a not-for-profit professional organization of individuals and institutions working to preserve and promote history. From its headquarters in Nashville, AASLH provides leadership, service, and support for its members who preserve and interpret state and local history in order to make the past more meaningful in American society. AASLH publishes books, technical publications, a quarterly magazine, and monthly newsletter. The association also sponsors regional and national training workshops and an annual meeting. 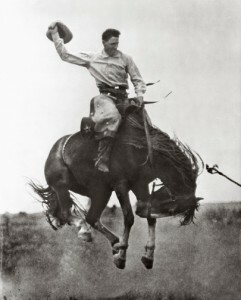 Image above: Unidentified cowboy on bucking horse, ca. 1922-1934. Tex Austin Collection. Palace of the Governors Photo Archives 200061.